If you have been reading this blog over the past 6 years, you know I am just a wee bit hooked on coffee. I am so proud that I have been able to cut back quite a bit (I was drinking the equivalent of more than one pot per day) and am down to 3 or fewer cups a day. This is HUGE for me. 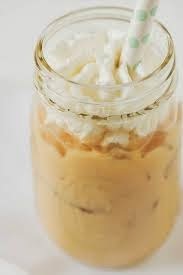 As we head into summer, I have a thing for iced coffee drinks. Unfortunately, unless you have a traditional iced coffee without add ins, you are basically just drinking away your calories. Today, I am making over a cafe favorite: the Starbucks Caffe Vanilla Fappuccino. This super delicious iced drink isn't for those who are trying to lose or maintain weight though. A grande (AKA medium) version contains 430 calories and 72 grams of carbs (I stick to under 50 for my whole day) -- a whopping 69 grams of carbs in this drink are sugar carbs. Oy! Not good! Today I have recreated this treat and have made it MUCH healthier! It doesn't taste exactly the same, but it is still absolutely delicious. Just blend it all together and ENJOY it! I actually topped mine with a bit of real whipped cream. I use a bit of heavy cream and a dash of whey protein in vanilla for flavor and a bit of natural sweetness. You can add unsweetened cocoa powder or cinnamon to the whipped cream if you like as well. My version WITH the whipped cream is 185 calories and 4 grams of carbs. Of course, you can absolutely skip the whipped cream if you are counting your calories. Keep in mind mine also makes you a BIG glass--or two small ones!